Most local residents will be familiar with the Hodnet Medical Centre, and those that use it will know that it has an in house pharmacy. However, perhaps not so many will be aware that prior to the Medical Centre being built, Hodnet had a separate chemist/pharmacy shop. This was based in premises on Shrewsbury Street and closed in 1990. In the normal course of events, that might be regarded as that; but in late 2010 a curious ‘survivor’ of this shop came to light, which provides a glimpse of the medical/social life of Hodnet and surrounding areas. This ‘survivor’ was a leather bound Private Prescription book used, from 1919 to 1979, by various Hodnet Pharmacists to record the dispensing of drugs prescribed by local doctors. The book came to light whilst the Market Drayton Museum were clearing their stores of all non Drayton items. The museum are unable to say how the book came to be in their possession; but it was presumably salvaged at, or before, closure of the Hodnet pharmacists shop, and was then donated to the museum for safe keeping by someone who did not feel it should be thrown away. As an item of local interest, the museum have now donated it to Hodnet Parish Council (HPC) who in turn, given that it contains some possibly confidential information about people still living, have asked Hodnet Medical Centre to look after it. In return, they have agreed to provide controlled access to it for purposes of legitimate research. A local Pharmacist was asked by HPC to look through the book, to evaluate its nature and historical interest. Some of her notes are reproduced below. 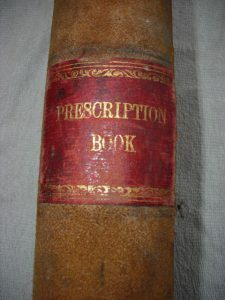 This is a private prescription book containing a copy of private prescriptions dispensed by the dispensing chemist in Hodnet between 9/4/1919 and 5/10/1979. (There are also three original prescriptions dated 1951/52). It is an important piece of local, medical and Pharmaceutical history showing how prescribing medication has altered over a period of 60 years. When I was studying to be a Pharmacist I saw old private prescription books and old prescriptions, so it was fascinating to see the old-fashioned symbols and Latin writing (from the earlier years) in the Hodnet book. The earlier entries sometimes only had the name of the patient recorded, but nowadays a full name and address of a patient is required. 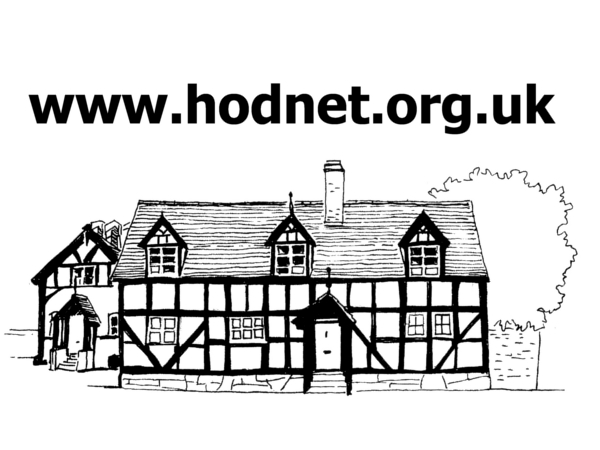 From there you can access information sheets on different aspects of pharmacy history, including ones covering ‘Prescription Reading’ and ‘Balances Weights and Measures’, both of which are particularly relevant to interpretation of the Hodnet book. 4. First entry for oral contraceptives (pg 271 21/7/1966) Lyndiol tablets . 8. The majority of entries from 2/4/1973 (pg378) to the end of book were repeats for the contraceptive pill. 9. I noticed the dispensing of ‘Algipan’ (pg 271 29/1966) and ‘Anusol’ (pg241 1/4/1952), such products still being used today. 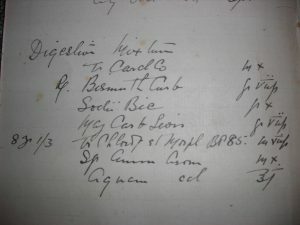 In its early pages, the book contains some recipes, possibly the Pharmacists’ own, for remedies that could be made up and supplied as ‘Digestion’ and ‘Bronchial’ Mixtures’, a photo of the ‘Digestion Mixture’ recipe being shown below. In addition to drugs recorded for human use, some entries also exist for items dispensed to local farmers for equine use and also to a Mr Williams, at one time the Hodnet Vet, for his veterinary practice. According to local historian, Gerald Mothershaws’ interesting book, ‘’Early and modern medical achievements and the history of Hodnet doctors’’ the earliest recorded Pharmacist in Hodnet was a Mr William Cooke, who seems to have been operating from around 1887 to 1905. The next one known is Mr Reg Watchhorn, who was trading during the 1920’s – 1930. He was followed by several Pharmacists in brief succession, starting with Mr Marsden then, briefly, Mr Barnes from Market Drayton, who in turn was followed in 1934 by Mr James Naylor, who died in 1937. In 1941 a Mr T Fenwick, also the local Dentist, was recorded as being in charge, and a label of his can still be seen in the book’s inside cover. From the late 1940’s to 1966 Mr and Mrs Stanley Lloyd ran the shop, Mr Lloyd also being an Optician. Thereafter Mr and Mrs John Wharton ran the shop until closure in 1990. James Naylor, Dispensing Chemist, Hodnet – 1934 to 1937. In December 2017 the web team were contacted by Dr Philip J Naylor, grandson of James Naylor. Philip, who now lives in Bristol is also the great grandson of Will Dodd, who was the odd job man at Hodnet Hall. sent us six photographs for the website. Here are the one’s which are relevant to this page. For descriptions of these images please see our page featuring old photographs of Hodnet.